A SHAVE CAUSED IT ALL. to Abate Cloud of Smoke. There was a fire scare at the new Scarritt building, Ninth and Grand avenue, about 7:30 o'clock last night. It being Sunday evening, few of the tenants were in their offices. 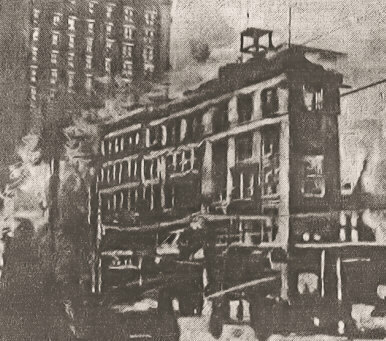 A still alarm was turned into fire headquarters. Outside the building there was nothing to account for the presence of the firemen. Janitors had told the few tenants when they had taken alarm when they saw the firemen enter the building that there was no danger. It all came about form a janitor heating some water on a temporary stove in the basement preparatory to taking a shave. He had his razor laid out, the strop was hanging on a nearby nail, and all that was needed was hot water with which to make a lather. Finally the water on the stove reached the boiling point, and the janitor reached to take it off. The pan was hot, and he burned his fingers. He attempted to deposit the pan of water on a table as quickly as he could. As he leaped, his elbow struck the stove pipe, and disjointed a section of it. A moment before he had thrown in a fresh shovelful of coal, and dense, black smoke issued from the disjointed section of pipe. It filled the basement and began to curl in dense volumes up through the open ventilators in the sidewalk. Someone in the Rialto building saw the smoke coming from the sidewalk, and turned in the alarm to fire headquarters. By the time the firemen reached there, the pipe had been put back in place, and most of the smoke had been blown form the building. The janitor heated another pan of water, and finished his Sunday shave.